The governor’s comment angered the APC leaders and women who came from the five states of the South East, forcing them to storm out of the stadium. The first lady spoke at the South East Women and Youths rally which held in Owerri, yesterday. The mammoth crowd was watching keenly the show of force between the governor’s men and supporters of Senator Hope Uzodinma who flooded the stadium. 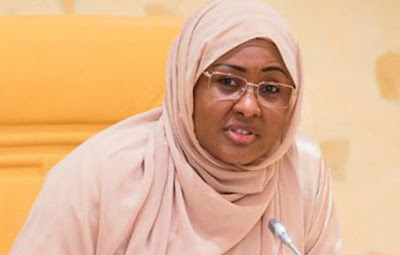 In her message, Mrs Buhari, who was represented by the wife of the Vice President, Oludolapo Osinbajo, called on the supporters of APC, to vote for the candidates of the party, at all levels adding that APC, will win in all the states. There were gun shots from security operatives when the wife of the Imo State governor was addressing the crowd. Two women sustained gunshot injury and were rushed to the hospital. Security agents had a difficult time checking the altercation between the two camps. When the governor’s wife refused to recognize Senator Uzodinma, the angry crowd booed the first lady of the state. However, the National Woman Leader of the APC, Hajia Salamatu Bewa Eluma, urged the crowd to vote President Muhammadu Buhari, Senator Hope Uzodinma and all APC candidates in the South East. Other speakers concurred and called for votes for APC candidates which did not go down well with Governor Okorocha who is supporting his in-law Uche Nwosu. A visibly angry Okorocha lampooned the APC, asserting that “the APC has not been fair to us, we are only being calm because of President Muhammdu Buhari who already has won in Imo State. We are going to support Buhari but let me tell you people, after we were cheated by the APC, in order to deliver the President, we formed an alliance with other political parties and leading among them is AA led by Ugwumba Uche Nwosu. According to Okorocha, “”Nwosu is APC in spirit. APC, owes Imo people an apology because of the injustice meted to Imo people. In Imo state, Nwosu will win Imo state. It is not anti party. We refused imposition in Imo state.” But the First Lady disagreed and urged the crowd to vote all the APC candidates both in the state and the South East. “I am happy with the crowd we saw today it shows that Imo is APC and I want to urge all our youths not to fight, avoid any form of crisis because President Buhari is a peaceful man. From what we have seen today President Buhari has won the South East the same way all our APC candidates have won” she stated. She further urged APC faithful to remain steadfast, asserting that “a vote for Buhari is a vote for progress. APC has done well and we must all support all APC candidates”. However, Senator Uzodinma who spoke to journalists afterwards, said “the world has seen how the governor is working against APC in the state. I want to appeal to leadership of our great party to look into the matter and take appropriate action. “ I cannot tell you whether his action is anti party or not but you could see the response of our members when he made his comments. You people will judge. But I will only tell him that only God and not him can make me governor. And I will become governor because Imo people have spoken and God heard their cries. Rochas has only few months to leave Government House and whether he likes it or not, he will leave on May 29, 2019” he declared. Also speaking earlier, the wife of Okorocha and Southeast zone coordinator of APC, Nkechi Okorocha, said: “You all are welcome to the Southeast APC rally for women and youths in Imo state. In 2019 our president will resume that seat that he has started. “We thank President Muhammadu Buhari, for his geniue leadeship and love for this country. For the future to be secured Buhari is the only hope. We are here to say that Buhari must return”.